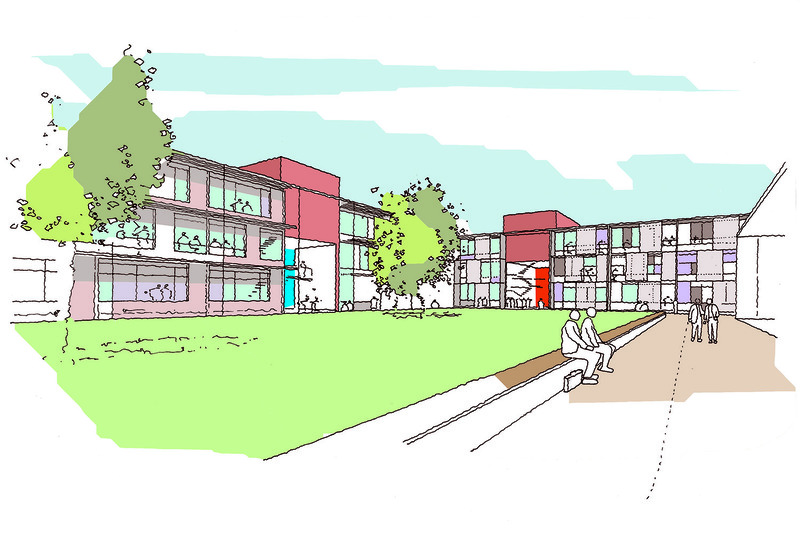 Creating permeability across the site and Integration of the new buildings into the setting. Planning Permission was gained for a development which sought to integrate the new buildings into the setting. Reducing the impact of the development on the site by creating smaller volumes that are generously spaced and creating permeability across the site. The existing condition presents a large single volume of the warehouse is inappropriate to the setting and the proposed development aims to rectify this with the provision of a number of smaller volumes. The smaller edges of the proposed development aim to define spaces of suitable scale and character. Whilst the proposed buildings have a relationship with one another, their permeable arrangement across the site offers view, interest and enclosure, whilst promoting movement and interaction with the surroundings. The proposed accommodation is divided across six new buildings; each designed with space around it and screened by deciduous trees which aid solar shading in summer. Testwood House itself is part three-storey, part two-storey in height. The new buildings are intentionally set at a lower level from Testwood House to differentiate between the old and new elements on site. The overriding aim has been to minimise the impact of this development: to restrict the height, reduce the mass and to provide generous landscape between buildings.